Make a statement with the Daybreak Bra Top that inspire confidence and balance. This stunning yoga bra features a deep rich geranium color with soft bright stars in various sizes hidden in the print. Be patient. Be hopeful. No matter how dark the night is, Daybreak will follow! With their unique and comfortable fit, durability and material of the highest quality, the Moonchild Bra Top in the Daybreak print is perfect for fitness, hot yoga and swimming. 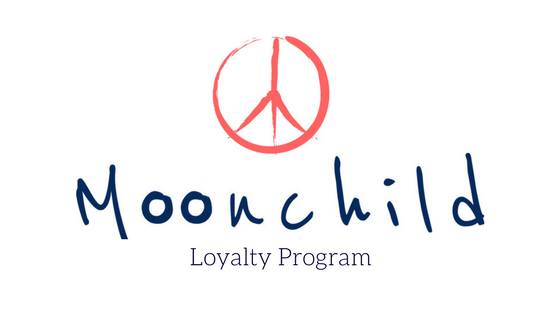 Moonchild Yoga Wear is designed in Denmark and made in EU with certified eco-friendly Italian fabrics. With their unique and comfortable fit, durability and material of the highest quality, the Moonchild Bra Top in the Deep Shade print is perfect for fitness, hot yoga and swimming. Moonchild Yoga Wear is designed in Denmark and made in EU with certified eco-friendly Italian fabrics. With their unique and comfortable fit, durability and material of the highest quality, the Moonchild Bra Top in the New Elements print is perfect for fitness, hot yoga and swimming. Moonchild Yoga Wear is designed in Denmark and made in EU with certified eco-friendly Italian fabrics. The beautiful North Bra Top from Moonchild Yoga Wear is designed to inspire women to move free and dream wild! The North print has a deep rich green color with soft signs and symbols inspired by the Nordic nature. The North print is designed to inspire you to Find Your True North! With their unique and comfortable fit, durability and material of the highest quality, the Moonchild Bra Top in the North print is perfect for fitness, hot yoga and swimming. Moonchild Yoga Wear is designed in Denmark and made in EU with certified eco-friendly Italian fabrics. Moonchild’s collections are inspired by the colours and lights of the Scandinavian nature blended with beautiful and feminine minimalism. We are committed to eco-responsibility, and are mindful of every decision we make in the manufacturing process. With their unique and comfortable fit, durability and material of the highest quality, these low to medium support bra tops are perfect for fitness, hot yoga and swimming. Moonchild Yoga Wear is designed in Denmark and made in EU with certified eco-friendly Italian fabrics. If between sizes - size up! Moonchild Leggings in the new Blazing Sun print is the perfect combination of Japanese shibori dying technique and Scandinavian minimalism. These stunning yoga leggings features a Marsala shibori color and contrasting stripes align the side of these beautiful leggings. Make a statement with the Daybreak Leggings that inspire confidence and balance. These stunning yoga leggings features a deep rich geranium color with soft bright stars in various sizes hidden in the print. The stunning feather adorn the back of each calf and root the design in nature. The beautiful Deep Shade leggings from Moonchild Yoga Wear are designed to inspire women to move free and dream wild! The Deep Shade Leggings are a mix of beautiful and subtle colors blended with the feminine minimalism from our Scandinavian heritage. Phrases of the moon adorn the back of each calf. Make a statement with the New Elements Leggings that inspire confidence and balance. These stunning yoga leggings feature an eye-catching gradient color blend. Washed out navy crosses through white and transitions into a hint of feminine peach at the hem. The minimalistic print emulates the look of watercolor paints with a nod to our Scandinavian heritage. Phrases of the moon adorn the back of each calf and root the design in reality. The beautiful North leggings from Moonchild Yoga Wear are designed to inspire women to move free and dream wild! The North print has a deep rich green color with soft signs and symbols inspired by the Nordic nature. Make a statement with the Peace Warrior II yoga leggings. These stunning yoga leggings feature an eye-catching color blend. The beautiful yellow and orange stripes on the side align next to a contrast dark panel with handdrawn peace signs. Now it is your time to be a peace warrior. The beautiful Silver Lining leggings from Moonchild Yoga Wear are designed to inspire women to move free and dream wild! The Silver Lining print has a deep rich grey color with a fading black and white effect. Every cloud has a silver lining! Never feel hopeless because difficult times always lead to better days. Moonchild Leggings in the new Tigerlily print is the perfect combination of Japanese shibori dying technique and Scandinavian minimalism. These stunning yoga leggings features a Brittney blue shibori color and contrasting stripes align the side of these beautiful leggings. The beautiful Zenith leggings from Moonchild Yoga Wear are designed to inspire women to move free and dream wild! The Zenith print has a deep rich grey color with soft grey signs and symbols transitions into a hint of feminine peach at the hem.